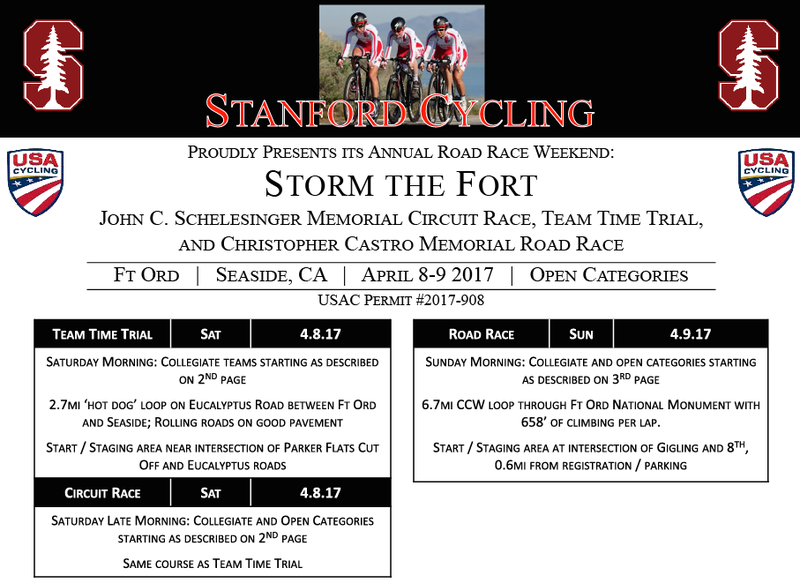 Stanford kicked off their road race weekend with the team time trial on the ‘hot dog’ loop, a 2.7-mile course with some gradual hills. Some racers had difficulty in the slightly wet road conditions making a rider’s rear wheel fling dirt behind, making drafting difficult. UC Berkeley’s Women’s A TTT team overcame the challenging conditions and took their second consecutive win with a minute between them and second place. Stanford won the Women’s B by about four minutes, and the Men’s B by almost two minutes. UCLA took the win for the Men’s A two minutes ahead of the second team. The Men’s C was the closest finishing team with Cal Poly winning by 33 seconds! The circuit race also took place on the ‘hot dog’ loop starting out with Dylan Gordan (CSULB) taking first in the Men’s C. Stanford had two of their racers place first for the circuit race: Anthony Baron in Men’s B and Daniela Deschamps in Women’s B. UC Davis’s Scott Cohen earned first place in the Men’s A, followed by teammate Ethan Frankel and UC Berkeley’s Reese Levine. Evelyn Delgado (CSULB) won the Women’s C. The Women’s A podium consisted of first place finisher Maddy Ward (UCLA) who has been having a killer season, second place finisher Claire Vakendom (UCLA), and Patricia Gonzalez (Stanford) in third. Sunday’s road race consisted of 658 feet of climbing on a 6.7-mile course. The Women’s B race top finishers were Daniela Deschamps (Stanford) in first followed by Samantha Quijano (Mills College) and Danie Monahan (UC Berkeley). Evelyn Delgado (CSULB) had a great weekend and took her second win in the Women’s C for the road race. Stanford’s Paul Talma won the Men’s C and Anthony Baron had his second win of the weekend in Men’s B, followed by UC Berkeley’s Eric Dasmalchi in second and Michael Beard (Cal Poly) in third. UCLA has been earning a lot of first places this season and Samuel Boardman just scored another in Men’s A. The Men’s D podium consisted of Josh Gieschen (Cal Poly) in first, Ted Cross (UC Berkeley) in second, and Bowei Wang (UC Irvine) in third. We are looking forward to next weekend up in Reno for Conference Championships!